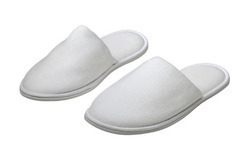 Pioneers in the industry, we offer disposable slippers and hospital slipper from India. As a quality driven enterprise, we are engaged in providing a superior quality assortment of Disposable Slippers. The offered slippers are dust resistant and are extensively demanded use in hospitals, laboratories, and medical centers. They provide high-level protection and prevent contamination. Customers can avail these white color slippers from us in varied sizes, as per their requirements. Further, these are available at a reasonable cost and will be delivered to you at the earliest. Backed by rich experience in this industry, we are successfully catering to the high demands in the market by supplying Hospital Slipper. These slippers are available in various sizes and colours to meet the variegated needs of patrons. Offered slippers are highly required in operation theatres for preventing dirt or other impurities to enter into the theatre and thereby to the patient. Operation Theatre Soundless Slipper is nicely tested for quality before its delivery to market and its qualitative packing is highly applauded by our clients worldwide.